I went to the AT&T store the other day and somehow ended up in a conversation about nutrition with the person working there. It's amazing, but you never know when you'll find others interested in what you are. I especially like asking this to people from other countries, outside the US. She said it was, "Papaya!" And then went on to tell me how different papaya is over here in the US. Which makes complete sense, and is what I want to talk about today. 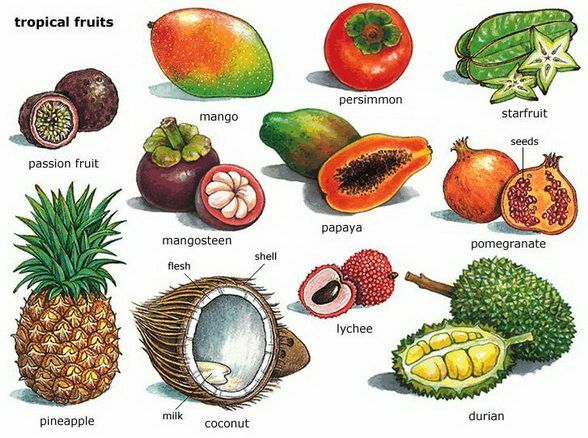 Tropical Fruit is so healthy for us... but in America we eat it unripened. When you travel, you begin to notice the difference too. Bananas are another great example. The common "Cavendish" bananas in the US have practically no taste (and look pale), even when ripened on the counter top, when compared to a banana ripened on the tree. The difference is night and day... as if you were eating two different fruits. But it's not just the taste... it's also the nutrition that's different. The longer a fruit gets to ripen on the tree, the more time it has to absorb minerals from the soil, up through the roots of the plant. The less time it has to ripen, the less minerals it will have... the more nutrient deficient we end up! So even if we try to eat tropical fruit while living in America (unless we're lucky enough to live in a warm enough climate, near these fruit trees), we're not getting the nutrition that we think we're getting. Since most people in America live in areas that can't grow these fruits it's hard to get access to them after they tree-ripen without them going bad. So what's a way around this? It's not to supplement with artificial mineral pills... that's for sure! We can't absorb them, since they're not natural. So that's a waste. One of the reasons why tropical fruit goes bad is because of the water inside the fruit. When you remove the water... i.e. dehydrate... they last for much longer and maintain their nutritional value. Unfortunately, there's very few companies that dehydrate tree-ripened tropical fruit, and if you find them it's very expensive and not too practically to eat regularly. Herbs can grow in all different types of climates, take less time and effort to grow them, and are packed with even more nutrients for a much more affordable price. They're the secret to amazing health that almost no one looks to find. Instead we're too distracted by the next "super-food" that's over-priced and disappears from the spotlight the following year. The best thing about herbs is that a little bit goes a long way. You'll be amazed at how just a few sprinkles of the right herb can make your hunger disappear. It's something you have to experience. That's the proof of how nutrient-packed the right herbs can be. In a world of unripened fruit, grown in mineral-deficient soil... Herbs grown in the wild are King!